“The Wonders” has its Madison premiere on Wednesday at 7 p.m. at the Madison Museum of Contemporary Art, 227 State St. FREE for members, $7 for non-members. Not rated, 1:51, three and a half stars out of four. “The family who best represents our traditional values will win a bag of money.” If Alice Rohrwacher’s “The Wonders” was just a satire of reality televiison, it would be pretty good for that line alone, niftily summing up the yawning gap between the professed goals and “journeys” of such shows and the greedy underpinnings beneath. But “The Wonders,” which won the Grand Prix at the 2014 Cannes Film Festival, uses its reality-TV satire as a minor ingredient in a luminous and keenly observed coming-of-age story. As Rohrwacher did with her previous film “Corpe Celeste,” she sinks so deep into the life of a pre-teen girl and her flawed but loving family that we feel like we’re immersed in a novel as much as a film. 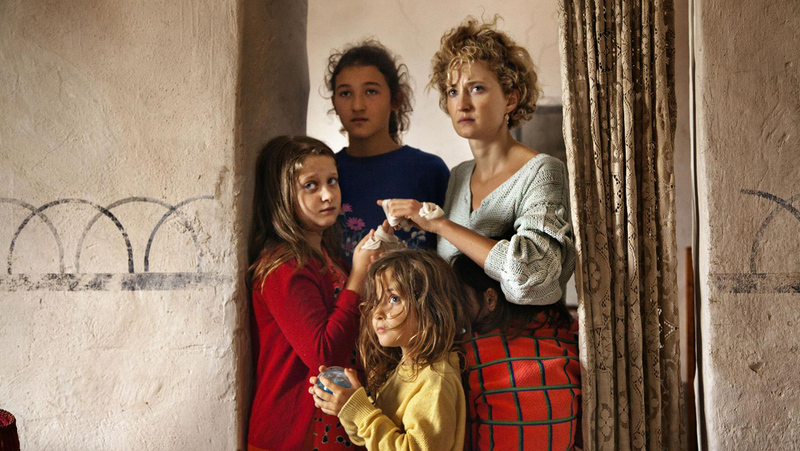 Maria Alexandra Lungu plays Gelsomina, the eldest of four daughters living and working under the thumb of their tyrannical father Wolfgang (Sam Louwyck) making artisanal honey in the Tuscan region of Italy. If that sounds like an idyllic life, rest assured that it’s hard, hard work. Wolfgang makes it harder, railing against his daughters for their supposed laziness, but also living in fear that his way of life, handed down generation to generation, is a vanishing one. There’s a scene in a rainstorm where Wolfgang and his family are stretched across the tops of their boxes of honey, desperately trying to protect them from the wind, that serves as a telling metaphor for the forces of modernization that Wolfgang is trying to beat back. One day, the daughters are exploring when they come across a mysterious woman, dressed in ancient clothes. She is Milla Cateny, the host of a reality television show called “Age of Wonders,” shooting a commercial for the show out in the forest. The fact that the glamorous woman is played by international screen star Monica Bellucci (currently seen in “Spectre”) heightens how surreal her presence is in Gelsomina’s ordinary world. She seems like she’s arrived from another planet, or another movie. The TV show is sort of an “Etruscan Idol,” as rural families who still do things the old way compete for the cameras for big prizes. Gelsomina urges her father to apply, knowing the cash money will pay off their debts, but the stubborn Wolfgang refuses. He senses, rightly, that once his beekeeping is presented as a novelty on television, it will truly signal the end of his way of life. Gelsomina goes behind his back, though, setting off events both large and small that drive the third act of the film. Dwelling on the plot of “The Wonders,” though, does it a bit of a disservice, as the real pleasure comes in Rohrwacher’s empathetic, naturalistic approach to the family, observing life on the beekeeping farm, letting tiny expressions reveal character more than dialogue or action. Much of “The Wonders” is presented by Gelsomina’s limited perspective, as she tries to lead her sisters and understand the adults in her life. In the end, the bee farm represents a sticky-sweet trap for her, one that she yearns to break free of, but understands the sweetness to life there that will be lost when she does.